These crab and corn cakes started out in a very different form. Originally, they were going to be corn fritters with a crab topping. Sounds great, right? That’s what I thought. In the end, the final product was less than stellar. They lacked texture, flavor, and personality – pretty much everything you want in a good dish. However, I wasn’t willing to give up on them entirely. Fresh corn and sweet crab make such a lovely combination – I knew there was potential there. So, I kept the corn and crab and then decided to add some Southwestern flair for flavor and personality. The result? It’s like the traditional Maryland crab cake visited Texas and met some new friends in the form of corn, lime juice, and cilantro and is now sporting boots and a Southern drawl. 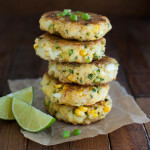 OK, that might be taking the cliché a bit far but, let’s just say these crab and corn cakes are everything I was looking for – crisp and golden on the outside, with tender crab and bursts of summer flavor from the fresh corn on the inside. I did keep one traditional ingredient though and that is the Old Bay seasoning. I’ll apologize now for those who live outside the United States or anywhere else where this herb mix isn’t available. Or, if you already have a cabinet full of spices and don’t want to buy a “specialized” spice. I get it. I tried making a batch with and without the Old Bay seasoning. The batch with the Old Bay seasoning really did taste better. However, the batch without it really wasn’t bad. It lacked the extra hit of flavor but was still really pretty good. So, you could skip it you really had to. If you’re feeling experimental, you could also throw in a pinch of cayenne pepper, celery salt, ground cloves, paprika, and cinnamon and get pretty close to the flavors of the Old Bay seasoning. These crab and corn cakes would also make a great appetizer for your Labor Day cook out this weekend. Nothing says summer like fresh corn. I would say something like enjoy these last few days of summer before fall arrives but I live in Texas and it’s going to feel like summer until October. So, instead I’ll just say have a great weekend (y’all). In a medium bowl, whisk together the eggs, mayonnaise, Dijon mustard, lime juice, Old Bay seasoning, and salt until thoroughly combined. Stir in green onions and cilantro. Then add in panko bread crumbs and cornmeal. Stir until well blended. Fold in corn kernels and crab meat until evenly mixed. Using a 1/4 cup measuring cup as a guide, divide the crab mixture into 12 equal portions; shape each portion into a 1/2-inch thick patty. Place a large non-stick fry pan over medium-high heat and coat with a thin film of oil. Working in batches, gently place about 4 crab cakes at a time in the pan. Fry until golden on one side, 3 to 4 minutes. Using a spatula, carefully flip the cakes over and fry until browned on the other side, 3 to 4 minutes more. Transfer the cakes to paper towels to drain briefly. Repeat with the remaining cakes, adding more oil to the pan as needed. Oh i got so hungry reading through this post. Now i want crab cakes like nothing else. I love how fresh and soft they look. Thanks, Ruby! I think the fresh corn kernels really contributed to how fresh and light these cakes were. I often make little fritters for dinner but never have tried a crab and corn version before. I love these! And have to make them. I do hope you get to try these. Crab and corn go so well together. Thanks for dropping by, Thalia! I was looking on Foodgawker this evening for corn recipes and this came up. The photo was stunning so I thought I would pop over and say YUM! Then I saw it had Old Bay seasoning in it. I was ecstatic, as today I made up a batch of homemade old bay, as we can’t get it here in Australia. I even wrote about crab cakes in the post! That’s awesome that you found a way to get Old Bay seasoning. I loved your story about the ground bay leaves. Sounds like something that would happen to me! I hope you get a chance to use your Old Bay seasoning on these crab and corn cakes. They really are quite tasty.